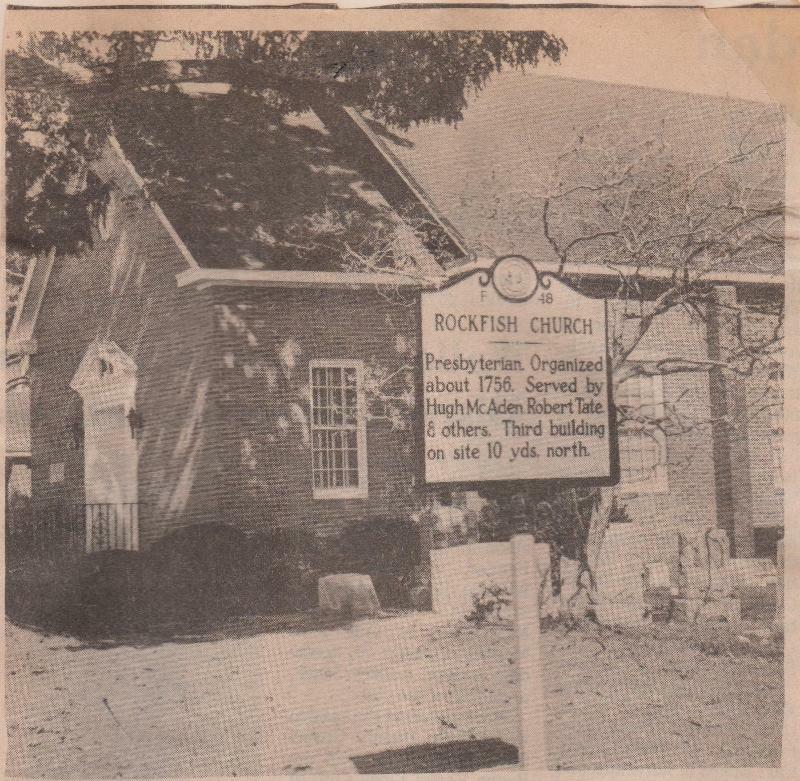 Rockfish Presbyterian Church was established in 1756 and is one of the oldest churches in our area. The church was established after a period of missionary activity by Reverend Hugh McAden of the New Castle Presbytery in Pennsylvania. A number of ministers served the church for short periods of time until the coming of the Reverend Robert Tate in 1799. Reverend Tate served the church for nearly one-half century. The oldest extant records of the church began in 1814 and the first statement that is legible concerns the finishing of a new church. The dedication of this build took place in 1814. This building was located a short distance southeast of the present church. This building was made of logs and was used for a number of years. On April 10, 1847, Reverend Duncan Black was installed as pastor and he served for forty-six years. In 1884 the present church was erected. In 1904 the Reverend William Pinckney Martin Currie was called as pastor and he served for thirty-six years. During the pastorate of Mr. Currie, the church as brick veneered and the building was renovated. In 1946, Reverend Ben F. Brown became pastor. During this pastorate a new Educational Building was erected which added greatly to the efficiency of the work of the church. During the early 1960's a new educational building was built following a fire that partially destroyed the church. Also during this period, the sanctuary was renovated. In 1972, the Historical Society of North Carolina dedicated a historical marker placed at the church.